Carrier Transicold of Detroit was named Carrier Transicold’s 2018 Dealer of the Year – North America. Pictured are (left to right) David Appel, president, Carrier Transicold & Refrigeration Systems; Mark Sparkman, president and owner, Carrier Transicold of Detroit; and Tom Ondo, vice president and general manager, Truck/Trailer/Rail Americas, Carrier Transicold. 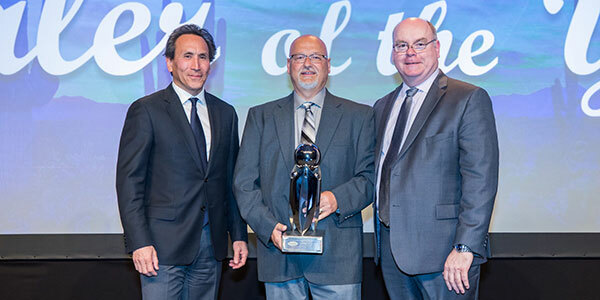 Carrier Transicold of Detroit and Refrigeración Especializada para el Transporte de Occidente (RETO) were named dealers of the year for North America and Latin America, respectively, at the annual meeting of Carrier Transicold’s Truck/Trailer/Rail Americas dealers. Carrier Transicold recognized the 2018 performance by its North America and Latin America dealers, reflected in a record 149 awards presented. Now in its 52nd year of operation, Carrier Transicold of Detroit, located in Lincoln Park, Michigan, is one of the original dealerships to join the Carrier Transicold dealer network when it was formed in the early 1970s. This marks the sixth time in its history that Carrier Transicold of Detroit has received the Dealer of the Year award. Along with Dealer of the Year, the dealer earned a NextLevel2 Platinum Award, which is given for achievements in customer satisfaction, business investment, service proficiency, sales performance and growth. RETO, based in Guadalajara, Mexico, is now a three-time Dealer of the Year winner, all within a span of 10 years. 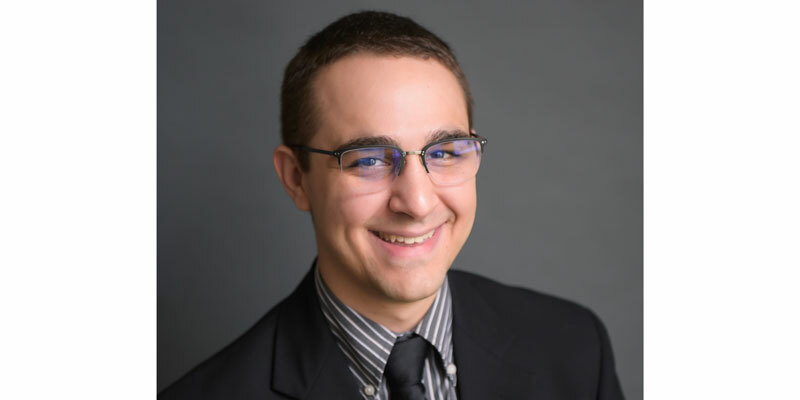 In 2018, the dealership broke previous sales records set for the region, according to Jesús Estrada, region director for Mexico and Latin America for Carrier Transicold. Seventy-five dealerships received awards for 2018 performance in areas of customer satisfaction, growth, business investment and service proficiency. Among them, Williams Carrier Transicold of Richfield, Ohio, attained the Extra Mile Award for exemplary customer service. The annual dealer meeting, held this year in Scottsdale, Arizona, was attended by Carrier Transicold employees and representatives from 183 dealerships in the United States, Canada, Mexico, the Dominican Republic, Guatemala, Honduras, Costa Rica, Panama, Colombia and Chile, with guests from Carrier Transicold operations in Brazil. 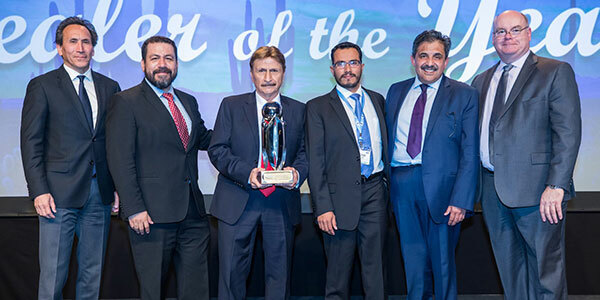 Refrigeración Especializada para el Transporte de Occidente (RETO) was named Carrier Transicold’s 2018 Dealer of the Year – Latin America. Shown are (left to right) David Appel, president, Carrier Transicold & Refrigeration Systems; Alejandro Genera, sales director, Latin America, Carrier Transicold; Rubén Almaráz, general manager, RETO; Hector Mercado, operations manager, RETO; Jesús Estrada, region director, Mexico and Latin America, Carrier Transicold; and Tom Ondo, vice president and general manager, Truck/Trailer/Rail Americas, Carrier Transicold.